Two rivals surrender to desire and fall in love in this wonderfully addictive enemies-to-lovers romance. 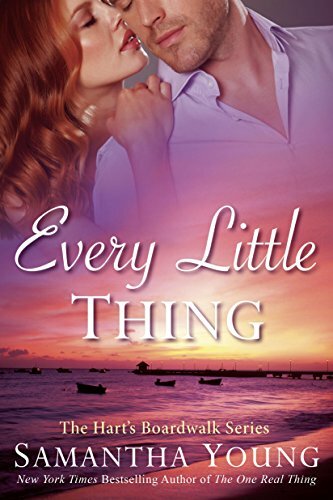 With Every Little Thing, Samantha Young delivers yet another amazing chapter in the Hart’s Boardwalk series. Every page draws you deeper into Bailey and Vaughn’s story, deeper into the lives of those who inhabit this cozy Delaware town. In The One Real Thing, as Cooper and Jessica’s story twined together, we met Bailey Hartwell and Vaughn Tremaine, felt the sparks even as non-stop derision shaped their relationship. Bailey is Hartwell’s princess—a small-town girl content to run the boardwalk’s inn. Vaughn is the impeccably dressed businessman from New York, who also runs a 5-star hotel in Hartwell. Seemingly hard-hearted as compared to Bailey’s spirit and warmth, Vaughn knows a thing or two about relationships gone wrong and he’s vowed to avoid them at all costs… forever. Even though there’s no denying no one gets under his skin quite like fiery redhead Bailey. But when her life falls apart, Vaughn comes to her rescue. Suddenly, Bailey sees past Vaughn’s icy exterior and defenses shatter, giving way to a night that was a long time coming. Bliss quickly morphs into heartbreak, however, and Bailey’s contempt for this fine-looking New Yorker turns hotter, sharper than ever. Both Vaughn and Bailey must let go of the pasts which have haunted them, if they’re to find real happiness with each other. I assure you—you’ll devour every page. Relish every moment. You won’t stop reading until you reach the very end, when you’ll close the book with a huge smile on your face. Full of tenderness, fire, sexiness and intrigue, Every Little Thing is everything I hope to find in a romance. I loved this book, love this series and am desperately hoping for more installments sooner than later!